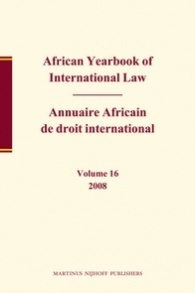 In 2003, with the publication of its 10th volume, the African Yearbook of International Law (Brill, The Hague) had completed its first decade of existence. The African Yearbook was kept alive and became a viable and respectable scholarly forum despite the lack of financial or institutional support. The African Foundation for International Law (AFIL) was established to provide this publication with institutional auspices. The creation of the African Foundation was also prompted by other considerations related to the teaching, dissemination and development of international law in Africa.